Almost every day, you read about a new, “best” measure to use in order to understand our members’ attitudes and sentiment towards their credit union. You may have heard of some of these: Satisfaction, Net Promoter, Customer Effort, Wallet Share, and Engagement. 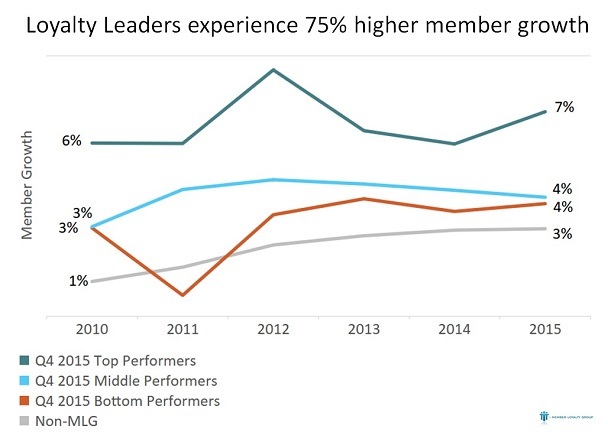 After working with more than 100 leading credit unions over the past nine years to help measure their Member Experience, we can confidently say, “It is not about the score.” It is instead about what strategies and actions are put in place to differentiate your credit union and to build relationships with members. 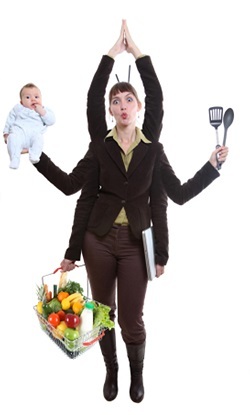 The various Member Experience measures are simply tools to assist you in doing this. They each provide different information, and selecting a few critical measurements that work in concert can be the most effective approach. 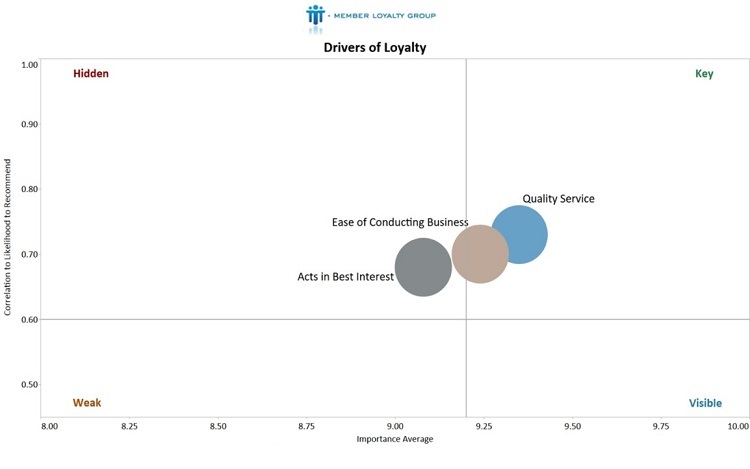 First, Loyalty measures ― such as Net Promoter ― tie most closely to financial results. 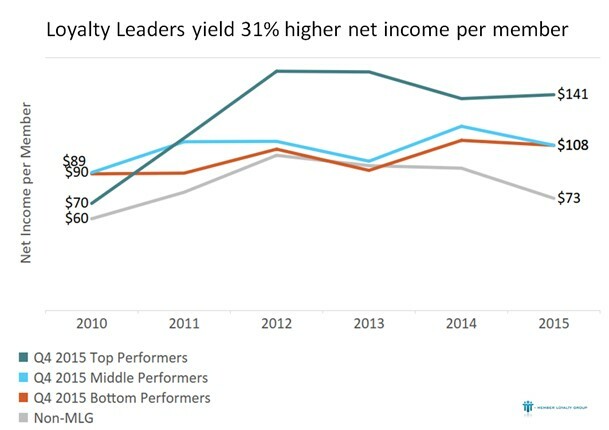 When comparing participating credit unions to each other and to the financial results of all credit unions over $200 million in assets, we find that top performing credit unions have higher ROA, net Income per member and membership growth. Putting specific measures in place to track performance in these key areas will help you pinpoint where you are successful and where you need to focus your improvement efforts. 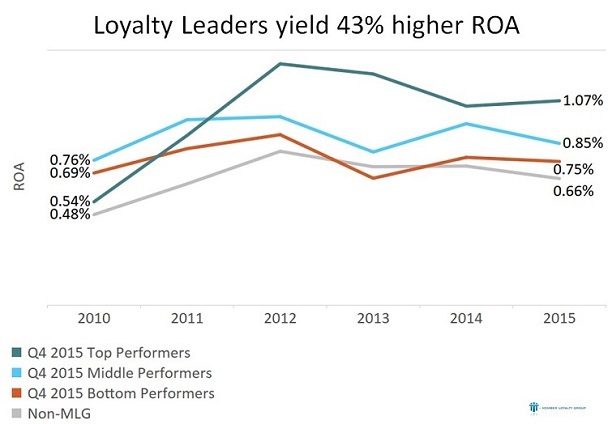 The chart that follows shows the correlations between these key drivers and loyalty across credit unions. Members expect an easy process. This driver is really an ante and the bar is always being raised by competitors and best practices in other industries. Members notice it when it is NOT there. It frustrates them and drags down loyalty. With more members interacting with you online or via mobile, the idea of quality service today encompasses much more than just a friendly teller in a branch. It includes friendly interfaces that reflect your brand and immediate help when things go wrong. It also means the availability of a genuine and helpful representative to walk you through a complex financial decision. Quality service is a key driver that members are very willing to talk about. A member may not always tell you directly that they don’t trust your credit union. It is an emotional response and requires some skill to measure. Scoring high in this area is one thing that we’ve found that high performing credit unions have in common. If members believe that you are truly acting in their best interest, they are much more likely to be loyal to your organization. The fact that as a financial cooperative, the credit union business model at its core was created to align with the best interests of its members is probably the biggest differentiator we have as an industry. What Does “Acts In My Best Interests” Mean? There is no “one measure to rule them all.” While you may use one or two main measures for your organizational scorecard, strategically using several key measures will give you the tools you need to drive member engagement and financial results. You can also learn more about Member Loyalty Group’s Member Experience programs by visiting www.memberloyaltygroup.com or contacting us at info@memberloyaltygroup.com. Michelle Bloedorn is CEO of Member Loyalty Group. This article originally appeared on CreditUnions.com on Sept. 18, 2017.